Copyright or Copy Whats all the fuss about, anyway? All cited images in this show are used under the Fair Use interpretation of copyright law. All others. 2 Copyright or Copy Whats all the fuss about, anyway? All cited images in this show are used under the Fair Use interpretation of copyright law. All others are used by permission. 4 I need a picture for my report or for my PowerPoint. Ill just go online and RIGHT click to copy a good one. 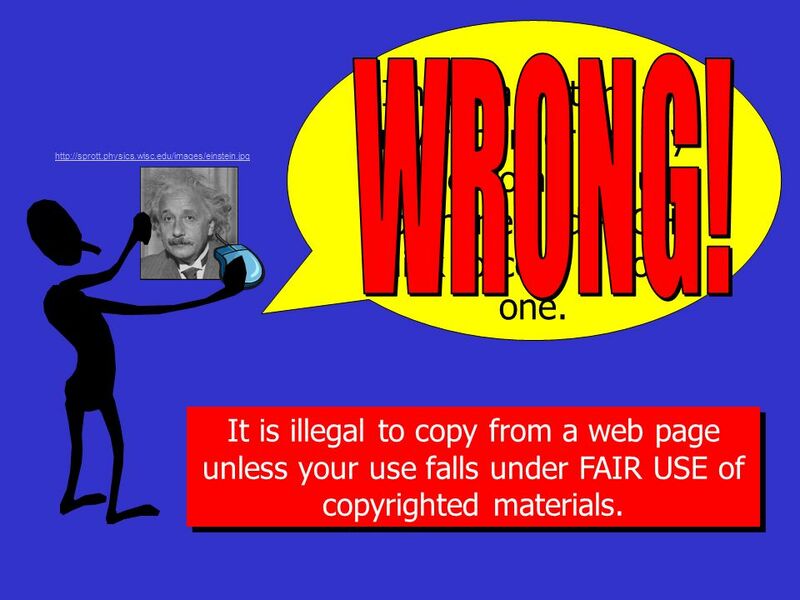 http://sprott.physics.wisc.edu/images/einstein.jpg It is illegal to copy from a web page unless your use falls under FAIR USE of copyrighted materials. 5 Ok, then Ill just copy a picture out a the encyclopedia and paste it in. http://www.nv.cc.va.us/home/rriester/images/einstein-tongue.gif Copyright applies to printed material, posters, web sites, music, video, song lyrics, newspapers, and magazines. 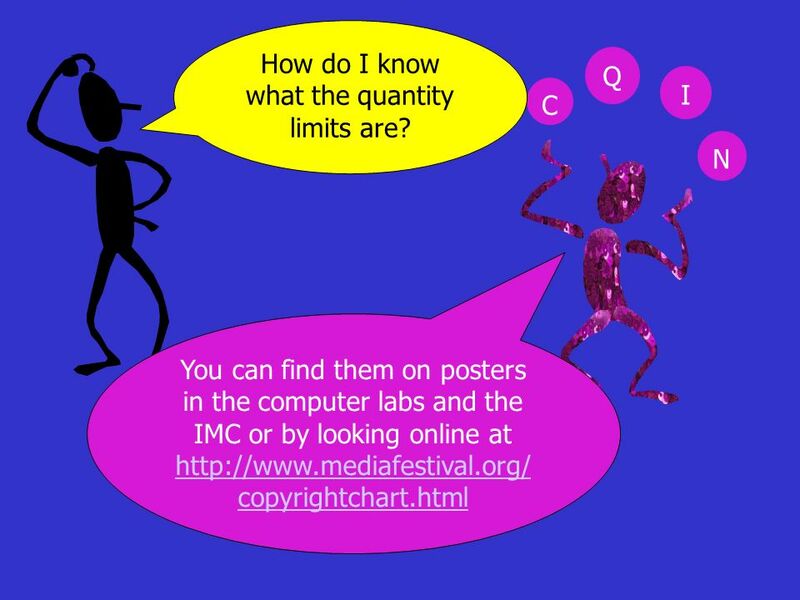 You must follow Fair Use with any of these. 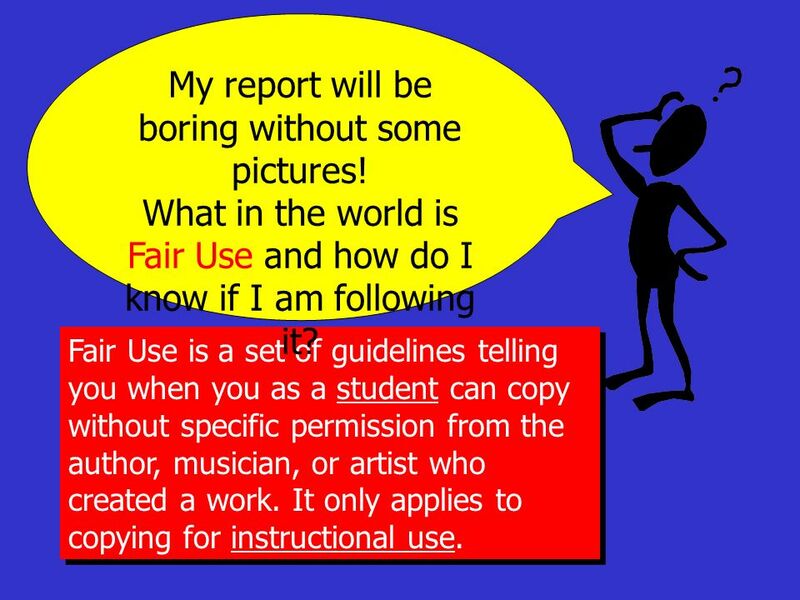 6 Fair Use is a set of guidelines telling you when you as a student can copy without specific permission from the author, musician, or artist who created a work. It only applies to copying for instructional use. My report will be boring without some pictures! 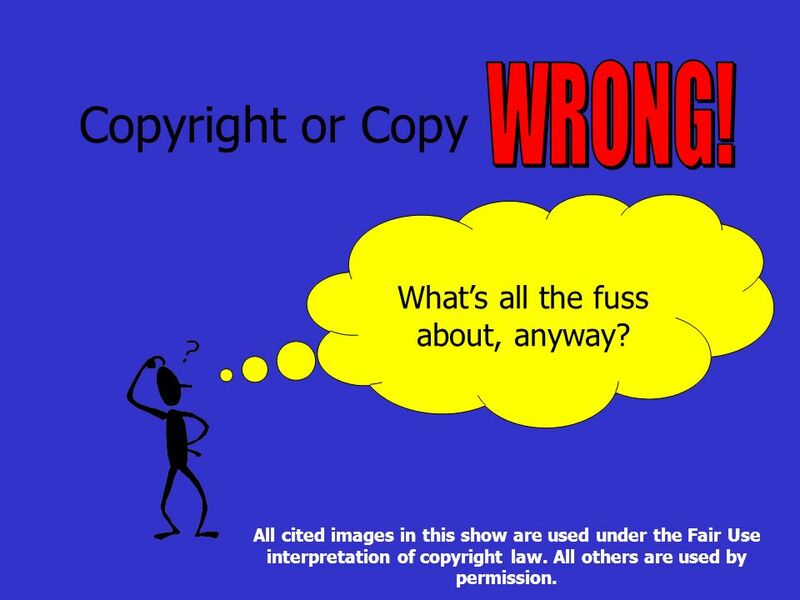 What in the world is Fair Use and how do I know if I am following it? 7 C Q I N No Biggy. Just remember these letters. Oh, Man. 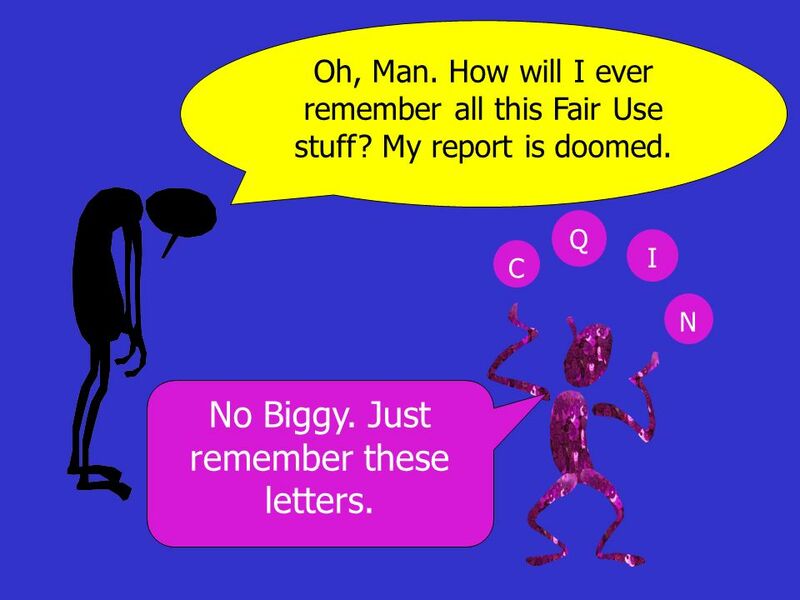 How will I ever remember all this Fair Use stuff? My report is doomed. 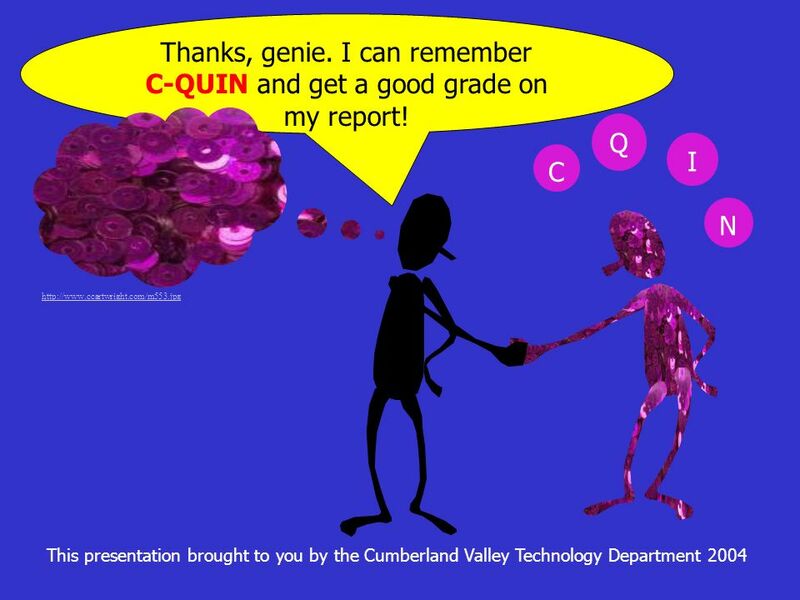 8 Im the C-QIN genie. 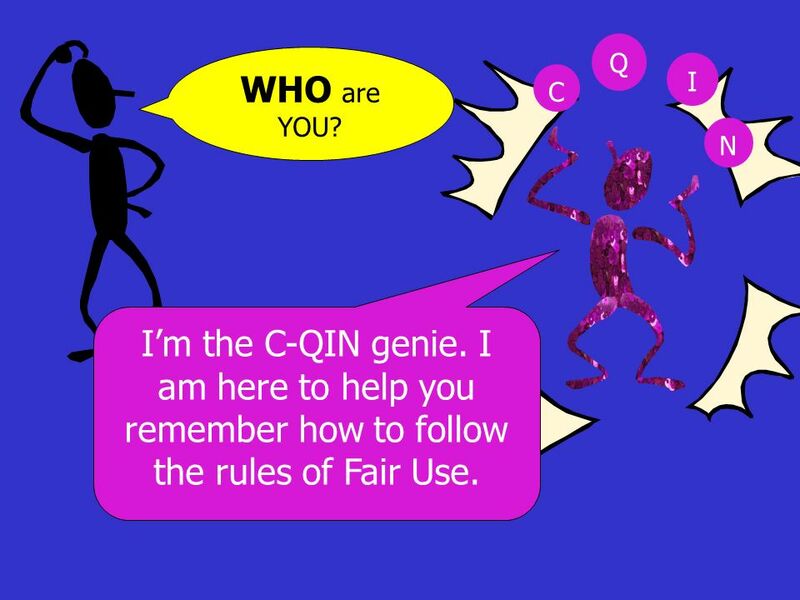 I am here to help you remember how to follow the rules of Fair Use. C Q I N WHO are YOU? 11 C Q I N One more thing. Always show that you followed Fair Use guidelines by putting a Fair Use notice on your report, PowerPoint show, or other project. And of course, you must include a bibliography in the correct form. All cited images in this report are used under the Fair Use interpretation of copyright laws. All others are used by permission. Yes. 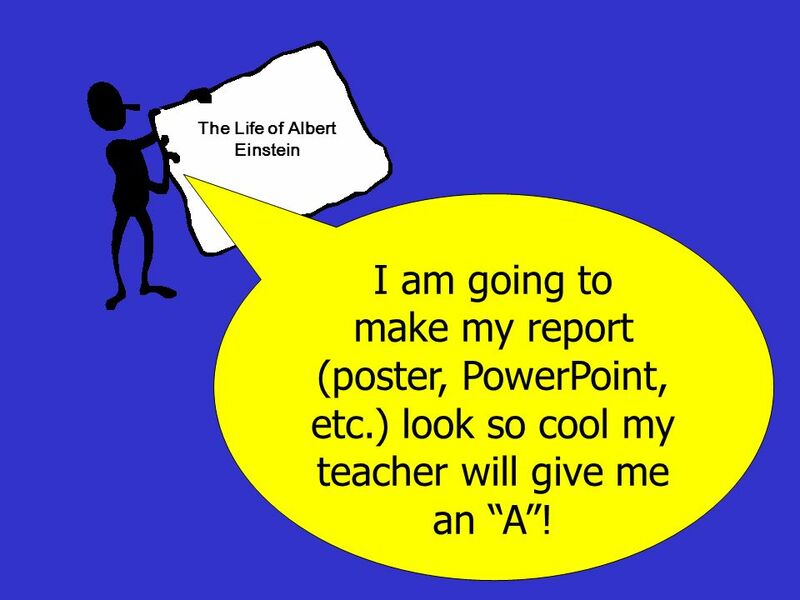 I got that, just like this PowerPoint show! 13 Bibliography Agnew, Janet, Glen Gummess, and Mike Hudson. A Visit to Copyright Bay. 22 May 2004. University of St. Francis. 6 Sept 2004.. Image of Albert Einstein. No date. Online image. Sprotts Gateway. 10 Dec 2004.. Image of Albert Einstein with tongue. No date. Online image. Rebecca L. Riester, Associate Professor of Chemistry. 10 Dec 2004.. Image of sequins. No date. Online image. Cartwrights Sequins and Vintage Buttons. 10 Dec 2004.. Purdue University Online Writing Lab. Using Modern Language Association (MLA) Format. Dec 2003. Purdue University. 15 Dec 2004..
Download ppt "Copyright or Copy Whats all the fuss about, anyway? All cited images in this show are used under the Fair Use interpretation of copyright law. All others." Internet and Network Safety YKSD Policies. YKSD Board Policies 10 Pages of YKSD Board Policies exist for your protection. They are available from your. Ontario School Library Association: Curriculum Supports 2003 Academic Honesty: The Legal and Ethical Use of Information. C opying Not Allowed! 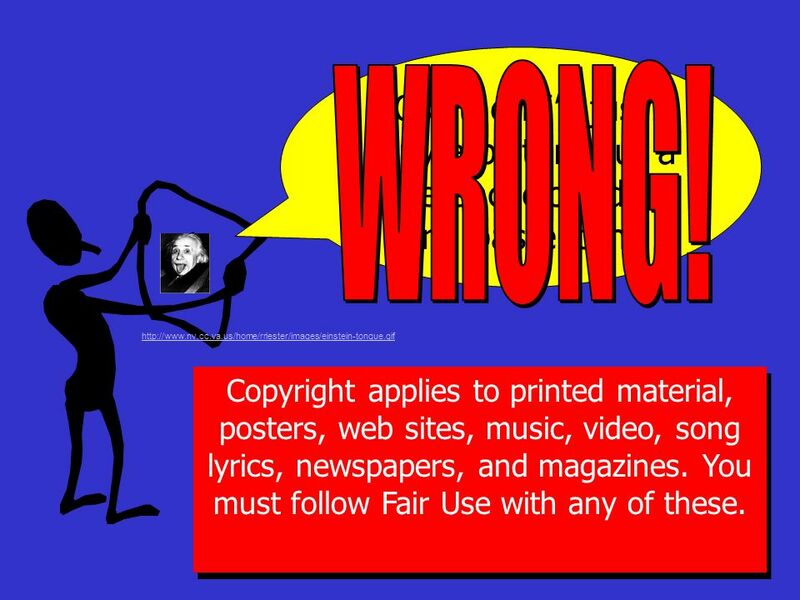 Copyright and Fair Use Guidelines for School Projects Created by Debbe Brooks Madison County TECOS Team Spring 2005. 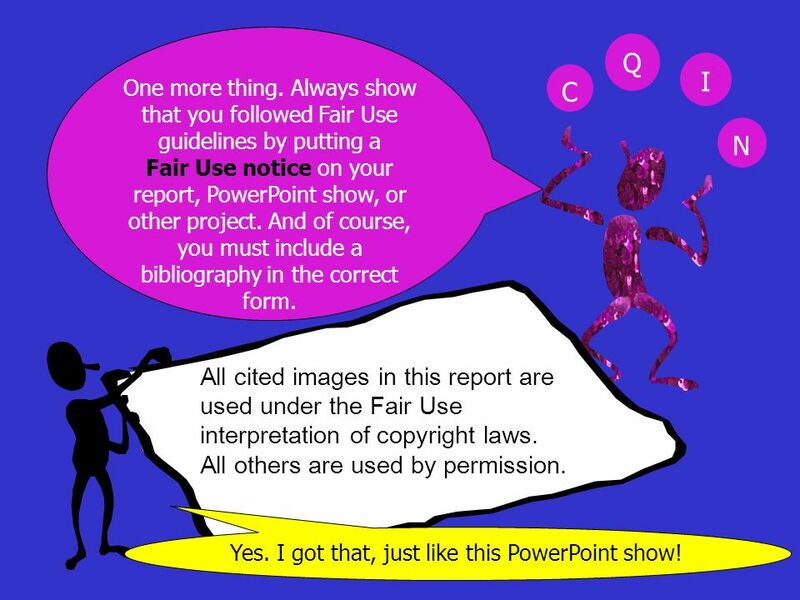 Fair Use Notice Certain materials in this presentation are included under the fair use exemption of the U.S. Copyright Law exemption and have been prepared. Power Point Tips How to With Wasting Time Follow Each Step. Song Title Here by Artist Here Your Name Here Health Through Music. Creating Citations Objective: Students will understand how to create a citation using MLA format. 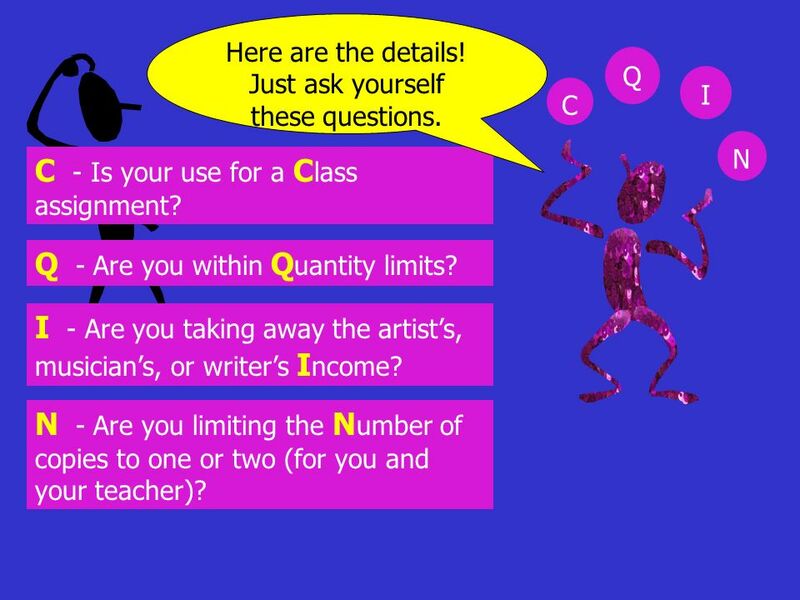 Copyright, What Educators Need to Know About Copyright, Fair Use, and Public Domain Public Domain. WORDS… more than just letters. 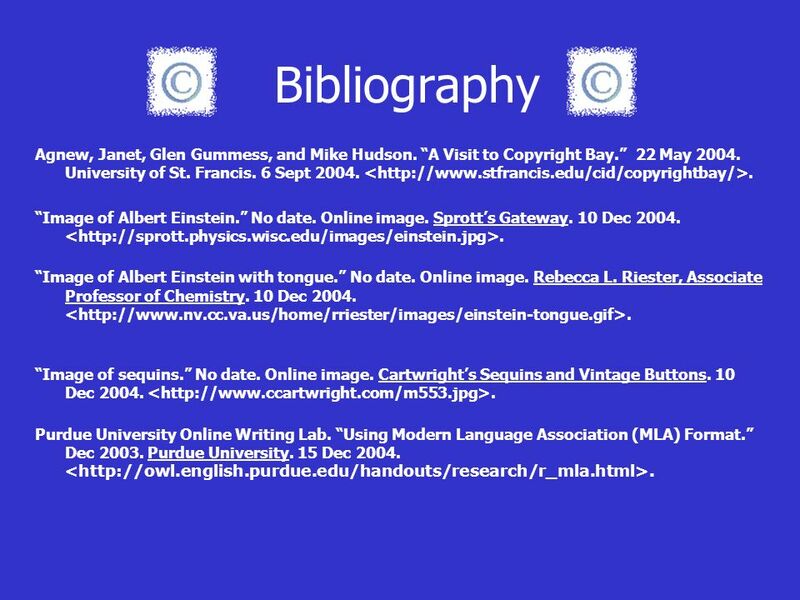 Evaluating and Citing Electronic Resources Created by Doreen E.C. Brown, MLIS Updated 2/5/2010. A “bundle of rights” controlled by the owner Distribute the work Reproduce the work Display the work Perform the work Create derivative works. MLA CITATION Ask yourself and answer What is a citation? Why is a citation needed? When do you need a citation? click 1.